Whitsunday Island is a popular tourist resort island for both day-trippers and overnight visitors and is the largest and most popular island of the Whitsundays. Most famous for its 2.8 mile (4.5km) stretch of pristine sugary white sandy beach known as Whitehaven Beach, Whitsunday Island's beauty is unrivalled. 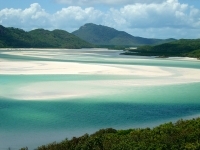 Featuring what is said to be the purest sand in the world (98 percent silica), the American government considered mining the sand from Whitehaven Beach for military purposes in the 1960s but, thankfully, this never happened and the beach is now protected within the bounds of the national park. Many boats dock at the beach daily bringing thousands of tourists to explore one of the most famous beaches in the world. Tongue Point features a wooden trail which stretches up to a lookout point over Whitehaven Beach - the ideal location for that picture-perfect postcard shot.